Share the rich history and crucial mission of the U.S. Merchant Marine Academy. Spread the word by sharing any of the content below. For 75 years, the U.S. 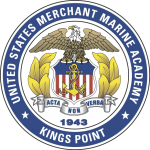 Merchant Marine Academy has prepared leaders of exemplary character and expertise who are committed to serve American economic and national security interests. Following graduation, U.S. Merchant Marine Academy graduates are committed to serve 8 years in the armed forces or reserves. “The World is Our Campus” is more than just a motto. It’s our year of real life training at sea to ensure we’re ready to step on deck day one with the trust of everyone on board.